What is the most important thing you bring to school each day? This is a question I always ask my students at the beginning of any leadership workshop I facilitate. Not surprisingly, the most common answer I hear is…“my backpack”. After all, the backpack contains each of the necessary tools for learning, right? Actually, I believe this answer is partially correct. It is indeed the backpack that serves as the most important thing one brings to school each day, but the backpack I’m referring to does not contain a single school supply. It’s called our emotional backpack. Let’s explore the difference between the physical backpack (the one that fits over your shoulder and contains school supplies) and the emotional backpack (the one that resides in your head and heart and contains your thoughts and emotions). Every morning, students walk into their classrooms and proceed to empty their physical backpacks. Whether it’s the previous night’s homework or a handful of text books that were used to seek core content knowledge, every student is used to this procedure. Once their backpack is emptied, it sits idly in a locker or cubby, only to be filled again at the end of the day. This “filling up” and “emptying” process is very similar to the current structure of our school system. We fill up their minds with knowledge, then we ask them to empty (or express) this knowledge in the form of a test. Unlike the physical backpack, students rarely have an opportunity to empty (or express) what’s in their emotional backpack and the repercussions of this are endless. Let me give you an example of how this might look in a classroom. Jennifer walks into her school with a smile on her face. Her two hours of homework are complete and she is ready for the Chemistry test that she has studied feverishly for. With her physical backpack emptied, she walks to her assigned seat, ready to start the “filling” process. By all accounts, she is ready to learn. However, hidden behind the smile, her emotional backpack is filled with a swarm of negative thoughts, which are the result of a rude comment a friend had made about her earlier in the day. Knowing that she doesn’t have an opportunity to empty (or express) her frustration, she simply represses it and calls on her willpower to get her through the day. At lunch, when her friends ask her how her day is going, she responds with a customary answer of “good”. Even though her emotional backpack is starting to burst at the seams, she can’t possibly let anyone else know that she’s hurting. That’s not the cool thing to do for a teenager. Despite the fact that Jennifer did well on her Chemistry test and took all of the necessary notes in her classes, she walks into her bedroom after school and proceeds to cry. For this is the only safe place she has to empty her emotional backpack. Here’s the irony in this story…if you looked at Jennifer’s academic profile (test scores and grades), you would say that she is extremely successful. Is she really successful though? I guess it depends on your definition of success. Sadly, success in school is typically measured with concrete assessment tools, which are quite easy to quantify. In my opinion, success is a combination of one’s IQ (intellectual intelligence) and EQ (emotional intelligence). Having said this, Jennifer isn’t as successful as one would think. While she has certainly received the necessary tools to excel academically, she doesn’t possess an emotional toolkit that will help her to effectively manage her thoughts and emotions. In our quest to fill the physical backpack with “core curriculum”, we are overlooking the emotional backpack, which is the “core of the child”. I could not agree with you more. We so often measure student success only by what we can see, measure, and comment on. It’s unfortunate that students seldom get an emotional break. 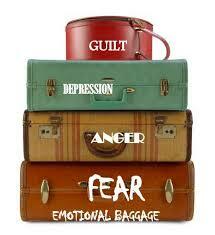 I believe we must spend time everyday filling the unseen bag with positive emotions. If not, as the day goes by the emotional bag gets weighted down with destructive emotion. I liked the back pack metaphor.Cultivation of emotional intelligence skills seems to be missing in our schools- a big loss. Gald to read your blog. Jagdish P Dave PhD,Psy D.
I really love how you express these things. As a teenager myself who used to listen to you every other Friday, I feel like you are one of the only adult who understands us. I love how you took the idea of someone seeming happy but hiding it so well and how that contributed to their emotional backpack. I am glad your blog exists and it make me happy that at least on person gets it. Hi Nu-Isis. Thanks so much for taking the time to share your kind words. I’m glad my blog speaks to you.